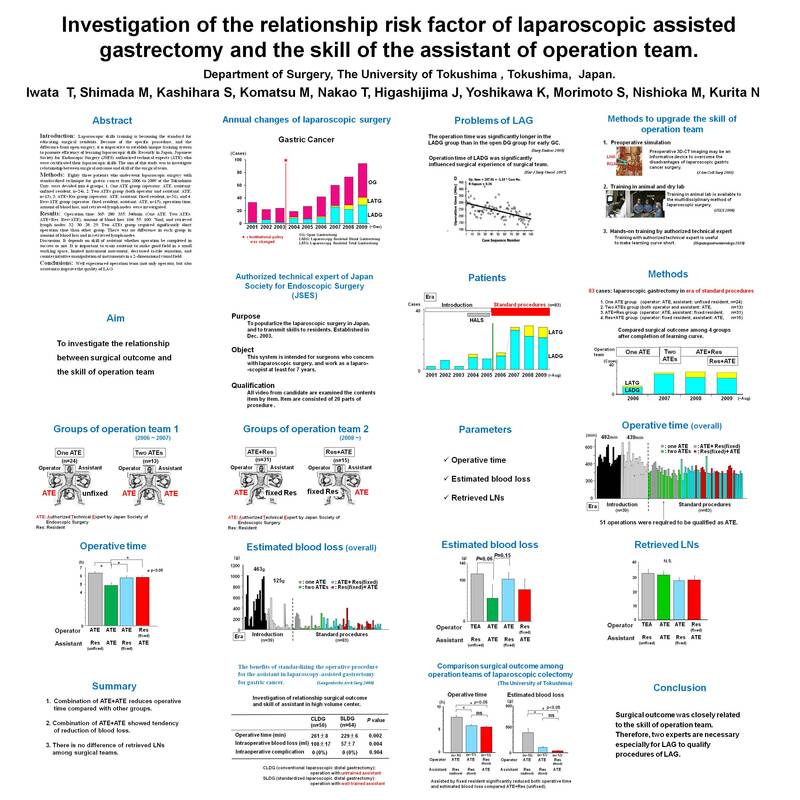 Investigation of the Relationship Risk Factor of Laparoscopic Assisted Gastrectomy and the Skill of the Assistant of Operation Team. Introduction: Laparoscopic skills training is becoming the standard for educating surgical residents. Because of the specific procedure, and the difference from open surgery, it is imperative to establish unique training system to promote efficiency of learning laparoscopic skills. Recently in Japan, Japanese Society for Endoscopic Surgery (JSES) authorized technical experts (TA) who were certificated their laparoscopic skills. The aim of this study was to investigate the operation team as the risk factor of LAG. Methods: Eighty three patients who underwent laparoscopic surgery with standardized technique for gastric cancer from 2006 to 2009 at the Tokushima Univ. were devided into 4 groups, 1. One TA group (operator: TA, assistant: unfixed resident, n=24), 2. Two TAs group (both operator and assistant: TA, n=13), 3. TA+Res group (operator: TA, assistant: fixed resident, n=31), and 4. Res+TA group (operator: fixed resident, assistant: TA, n=15), operation time, amount of blood loss, and retrieved lymph nodes were investigated. Results: Operation time: 365: 280: 335: 340min. (One TA: Two TA: TA+Res: Res+TA), amount of blood loss: 104: 55: 100: 76ml, and retrieved lymph nodes: 32: 30: 28: 29. Two TA group required significantly short operation time than other group. There was no difference in each group in amount of blood loss and in retrieved lymph nodes by multivariate analysis. Discussion: It depends on skill of assistant whether operation be completed in success or not. It is important to train assistant to make good field in a small working space, limited instrument movement, decreased tactile sensation, and counterintuitive manipulation of instruments in a 2-dimensional visual field. Conclusions: Combination of experienced operator and assistant utilizing precise preoperative imagings should be organized to improve the quality of LAG, and may reduce surgical risks and improve the quality of LAG.